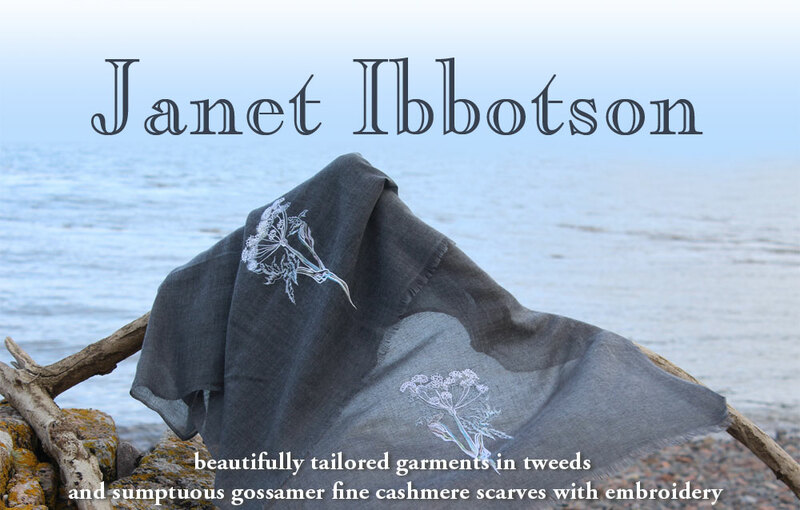 After a long career as a designer working in Leather and Suede, Janet now specialises in making beautifully tailored garments in tweeds and sumptuous gossamer fine cashmere scarves with embroidery inspired by her watercolours. You can visit her at one of the five shows that she attends each year or come to her studio for 'Spring Fling' which is a wonderful long weekend of open studios the length and breadth of Dumfries and Galloway at the end of May each year. Every style that Janet creates can be customised to suit the client better. Colours are chosen carefully and details of fit and measurments are taken. Hand felted detailing and/or embroidery can further enhance your choice of garment, subtle details that mean your garment can be dressed up or dressed down. The 100% cashmere scarves are elegant, lightweight and deliciously warm.